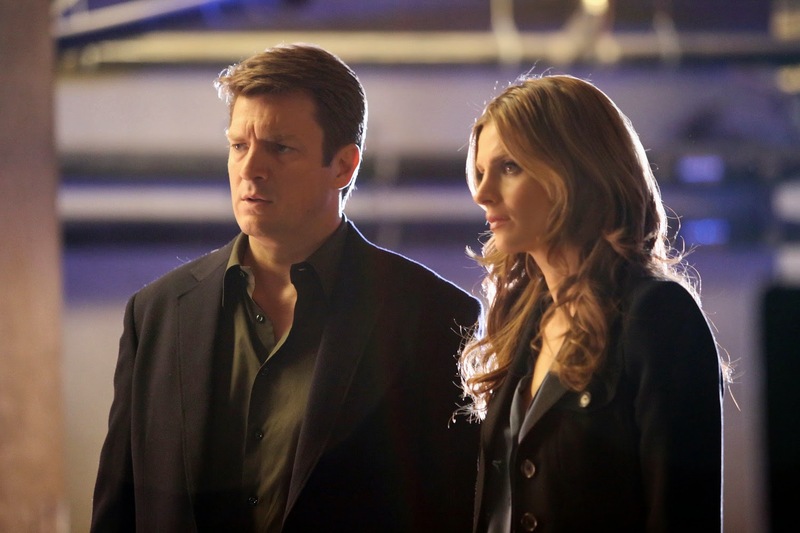 After Castle's stunning romantic proposal to Beckett, what happens next? TV's magnetic crime-fighting couple faces a whole new set of challenges as they juggle wedding plans and their most intriguing cases yet in ABC's Castle: The Complete Sixth Season. Beckett's new job with the Justice Department takes her away from the wisecracking love of her life. But Castle's devotion to his new fiancée - and her fascinating line of work - jeopardizes her career and creates a chain of events that might separate them forever. Back on the home front, Castle is none too pleased to discover his daughter has seemingly been captivated by, and now living with, her new, free-spirited boyfriend. It's a season of surprises you won't want to miss! Seasons one through five in a nutshell: Richard Castle (Nathan Fillion) is a writer who partners with the NYPD. 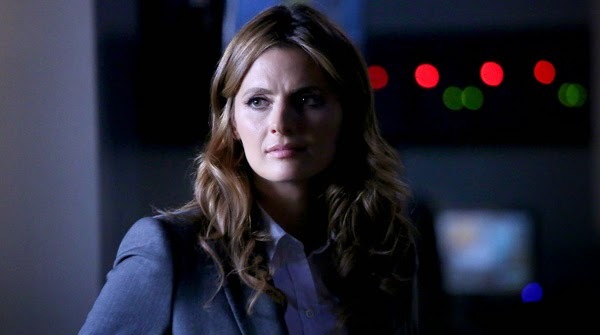 Detective Kate Beckett (Stana Katic) is his muse and at first she was very reluctant to have him on board. Castle’s humor, wit and charm won her over and he is now an integral part of the crime fighting team. That team consists of “bromantic” partners Detective Javier Esposito (Jon Huertas), Detective Kevin Ryan (Seamus Dever). The precinct overlord is Cpt. Victoria Gates (Penny Johnson Jerald). Cpt. Gates makes everyone call her sir and rules with an iron fist, but over the years she has begun to slowly warm up to Castle and has been accepting of his antics because they help solve cases. Cpt. Gates replaced the deceased Cpt. Montgomery who was pivotal to the search for the man who killed Detective Beckett’s mother. Beckett grows closer to Castle each season and he proposes. Now you are up to date and ready to watch Castle Season Six. As wedding planning begins, Beckett is given her dream job with the Dept. of Justice in Washington DC. This put a strain on their relationship and puts Castle in a life threatening situation. At home, Castle’s daughter Alexis (Molly Quinn) has moved in with her boyfriend Pi and it seems as though everything is changing. Castle’s mother Martha (Susan Sullivan) is the usually free-spirited member of the Castle family but she is grounded helping her son plan for his wedding and coming face to face with his father, played by returning guest star James Brolin. Season six contains the following 23 episodes on five DVDs. Highlights include many of the touching father-daughter and mother-son moments involving Castle. One of Castle’s best crazy theories appears to be true when the suspect appears to be a zombie. Bad guys this season even include ninjas, which while scary, are very exciting to Castle. In the end, Castle’s life is in danger and the cliffhanger/finale answers no questions. Detectives Esposito and Ryan find themselves in a life threatening situation this season, and they have the chance to show off their acting chops in a real tear-jerker episode. Richard Castle’s on screen mother Susan Sullivan and Daughter Molly Quinn are perfectly cast as well. The show ends with Castle’s life in danger but as Fillion said at Comic-Con, the show’s called Castle – he’s gotta be coming back. Because "Firefly" is no longer on television, I can say that "Castle" is absolutely my favorite show. The writing is great, and if you may attention you’ll catch a nod to the show here and there throughout the years (and the guest stars). The show is funny and entertaining and has not gotten old, even as it’s 7th season premieres on September 29th. The charisma of Nathan Fillion and the rest of the cast makes the show work. I can see Jon Huertas and Seamus Dever hanging out, cracking jokes at Fillion’s expense. If that’s not the case, I don’t want to know about it. "Castle" is presented by ABC studios on DVD with a 1.78: 1 ratio. It is a complete shame that "Castle" has yet to be released on Blu-ray. The show looks very good on DVD with the most detail noticeable in clothing texture. Skin tones are accurate and even and the show looks sharp and clear in the darkest New York City crime scenes. While it looks good I know it could be better on Blu- ray and I will keep hoping for that! The English Dolby Digital 5.1 sound is good, and I have nothing to really complain about except all the things I don’t know I’d hear if this were on Blu-ray with a 7.1 audio mix. It’s a dialogue driven show and the actors are always intelligible and at a consistent volume – and that’s the most important part. "Castle" can be counted on to provide a healthy list of special features all of which are worth watching. The commentaries and interviews are humorous and the show appears like it’s a blast to make. The best of the features can be found on Disc Five, which included blooper reel. Deleted Scenes – Available individually or with play all feature: “Be Ready”, “2 Cool for School – Extended Cut”, “Neck & Neck” and “Not the Enemy”. Character Commentary – In character, Detectives Javier Esposito and Kevin Ryan provide commentary on “case footage” from the episode “Need to Know”. 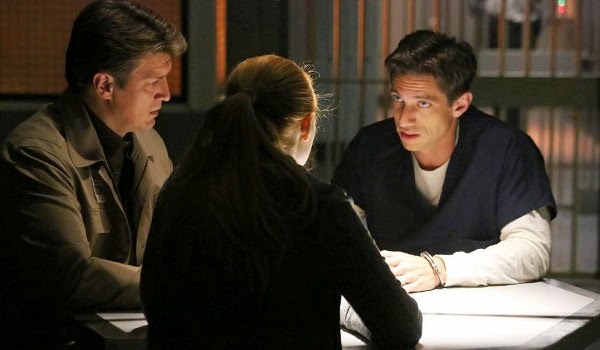 The characters talk about various cases and digress into discussions about Castle and Beckett’s relationship, hair, clothes and the assistance Castle provides before making their way back to the case at hand. Previews – Sleeping Beauty Diamond Edition Blu ray and Legend of the Neverbeast. 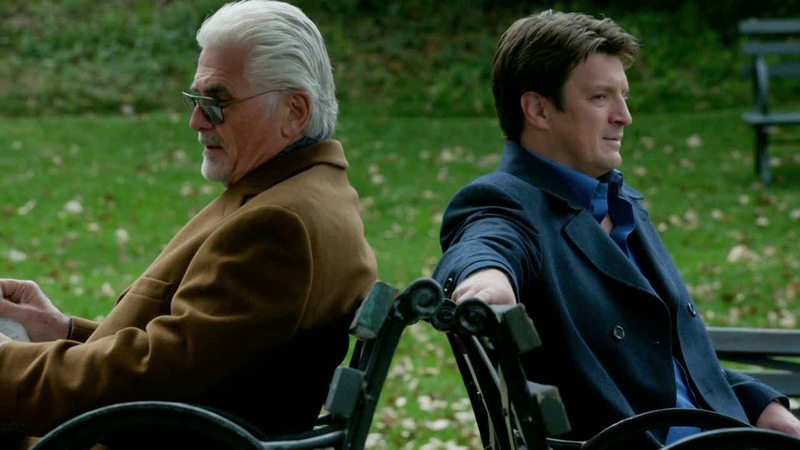 Audio Commentary – Actors Nathan Fillion and Seamus Dever, Director John Terlesky and Writer/Producer Terri Edda Miller provide a humorous commentary for “The Good, The Bad & The Baby”. The actors begin by mixing up their names and the writer jumps right in with episode details. 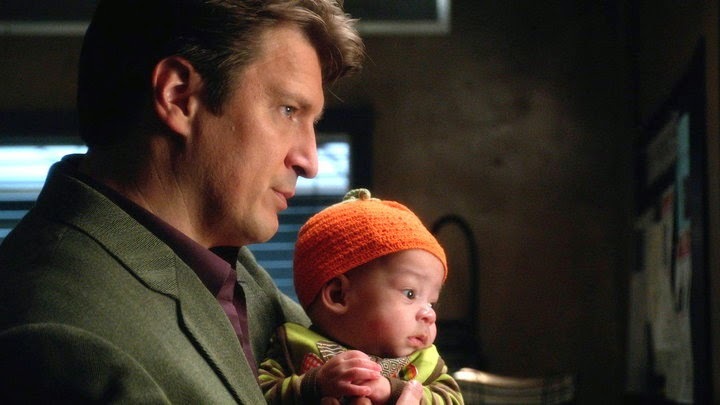 Fillion warns of the risks of acting with paper bag props and we learn a lot about working with infant actors – in this case 2 baby boys and 2 baby girls playing one part. They agree that Nathan Fillion is the most authentic on-screen dad for a man without children in real life and babies just love him. The commentary is amusing and flows well and Fillion only reminds them to talk once when everyone gets caught up in watching an episode they are clearly proud of. Audio Commentary – Actors Nathan Fillion, Susan Sullivan and James Brolin and Writer Terence Paul Winter provide commentary for “Deep Cover”. Nathan Fillion complements the amazing writers on the show and claims that about 4% is adlibbed by the actors. The group discusses Castle’s apartment, rehearsal and swapping Magic Mountain for Coney Island. Susan Sullivan talks about Fillion like a real son saying he is “my boy….I love him”. This commentary provides more humor and the sentimentality that apparent between Castle and his mom as well as Fillion and Sullivan in real life. Audio Commentary – Creator/Executive Producer/Writer Andrew Marlowe, Executive Producer/Writer David Amann and Executive Producer/Director Rob Bowman provide commentary for “In the Belly of the Beast”. While full of interesting information, this commentary lacks the actors input (let’s face it, everything is better with a little Fillion in it). Castle Karaoke: Extended Scene: Seamus Dever sings and Jon Huertas watches! Beckett in Peril: Alternate Edit – Contains optional Audio Commentary with Creator/Executive Producer/Writer Andrew S. Marlowe, Executive Producer/Writer Davis Amann, and Executive Producer/Director Rob Bowman. On Location with Stana – Filmmaker Mark Polish spent the day on location with Stana Katic while shooting and preparing for the season finale. Bloopers – Jokes, line flubs and even a Nathan Fillion mime. 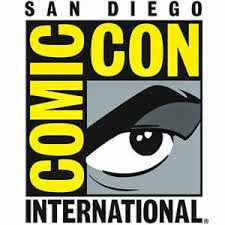 Sneak Peeks – ESPN College Football Playoff, Marvel’s Agents of S.H.I.E.L.D., Captain America: Winter Soldier, Jimmy Kimmel Live and Good Morning America. If you’ve ever watched an episode of "Castle" and not loved it, then season six will do nothing to turn you into a "Castle" fan. By now you either are or your aren’t a fan. I definitely am. "Castle" is a mix of humor and drama and Nathan Fillion is the perfect wisecracking sweetheart for the job. I’m always afraid to meet my favorite celebrities because if they aren’t awesome I will let it ruin a television show or movie I once loved. Both Nathan Fillion and Molly Quinn turned out to be amazing in person and they clearly have a wonderful father-daughter relationship off-set as well. Everyone is believable in their roles as partners, friends and family. "Castle" always provides a great list of bonus features where you get to see how much fun the cast and crew have at work. I can only hope that one day we see the show on Blu-ray….and of course (fingers crossed) that "Castle" season seven begins with Castle’s safe return to Beckett.